KCCG’s daily tasks and long terms successes are possible thanks to the amazing help from our wonderful volunteers. You can also be a part of this gardening community that fosters an awareness of the environment, transforms empty lots into green, productive living spaces, and cultivates physical and social health. Below, you can find more information and a general description of our volunteer needs by KCCG program, as well as the form to apply to become a KCCG volunteer. If you have any questions, call us at 816.931.3877 and ask for Gabe. If you'd like to donate to KCCG, click the button below and thanks for considering us! If you'd like to donate to KCCG, click the button below and thanks for considering us! Are you a people-person? Do you know or are you willing to learn about gardening and what KCCG has to offer? Then this is the perfect volunteer opportunity for you! KCCG is looking for volunteers to help with our daily front office responsibilities during the busy spring and summer months. This position will give volunteers the opportunity to engage and assist the amazing people that Kansas City Community Gardens serves on a daily basis. This seasonal position is available from February 15th through June 15th, Monday through Friday, 9 AM – 4 PM. This position also has opportunities from March 24th through May 12th, Saturdays from 9 AM to 12 PM. Applicants do not have to commit to the entire period but are welcome to volunteer as many hours, days, weeks or months as they would like. Volunteers will receive a confirmation email with instructions on how to sign on to the Front Office Volunteer Assistant Calendar, where they will be able to schedule their shifts. KCCG asks that volunteers book their shifts at least two weeks in advance of their chosen time. Volunteers are asked to notify Gabriel Racca, the volunteer coordinator, of any need to reschedule or cancel their shifts at least 24 hours in advance of the scheduled shift. The training session for the position will be February 9th, 3 PM – 5 PM. During the training session, front office volunteers will learn how to undertake all the responsibilities of the position; from signing up new members to checking out customers. If volunteers sign up for this position after February 9th, the Volunteer Coordinator will contact them to schedule a training session. If you're interested in this volunteer position, make sure to check the "Front Office Assistant" checkbox underneath the programs section in the form below. Seed Packaging: Volunteers assist in packing our seeds from bulk containers into our seed packets. This occurs during the pre-season months of January and February on Tuesdays and Thursdays. Time and dates are subject to change. Tomato Cages: We offer low-cost and very durable tomato cages for our members during the summer. These are constructed out of concrete reinforcement wire that we cut from a large roll of wire using wire cutters. Must wear long pants, long sleeves, sturdy shoes, and gloves. Opportunity available May through July. Large Community Garden Maintenance: We manage seven large community garden sites across the metro. Occasionally there are maintenance projects at each site that we can use assistance with. These might include cutting and clearing brush, removing debris, etc. Long pants, sturdy shoes, and gloves are required. Professional Service: We welcome your expertise in marketing, development, special event planning, etc. Donate your professional skills to further develop our non-profit organization. Learn more about Schoolyard Gardens. Repeated commitment option: Seeking volunteers that are able to commit on a continued basis to connect with one of our schools, pre-school through high school. Must be able to commit to working with a local school on a weekly or bi-weekly basis during the school day or after-school programming time for a complete growing season (spring, summer, or fall). 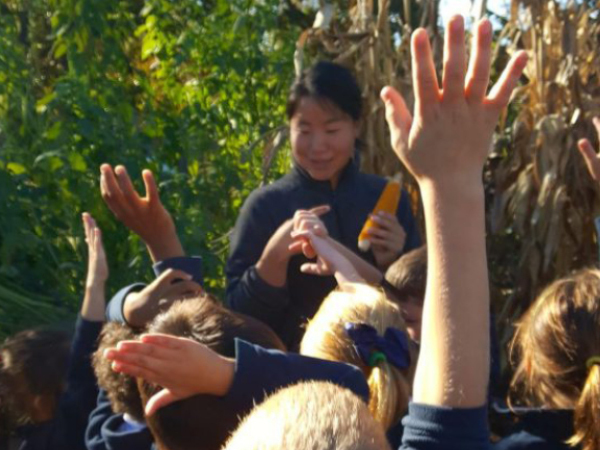 We will connect each volunteer with a school that needs hands-on assistance in the garden and you will serve as a garden assistant to the schoolyard garden program coordinator at that site. Volunteer orientation is required for participation in several school districts. We will equip each volunteer with tools and supplies, but basic garden knowledge is necessary. One-time commitment option: If working directly with schools is not for you we can also use volunteers to assist with organizing and completing plant orders in our greenhouse. We need somebody to pull together orders that each school places with us at the beginning of each season. This occurs during March, May, and August. Learn more about Community Partner Gardens. 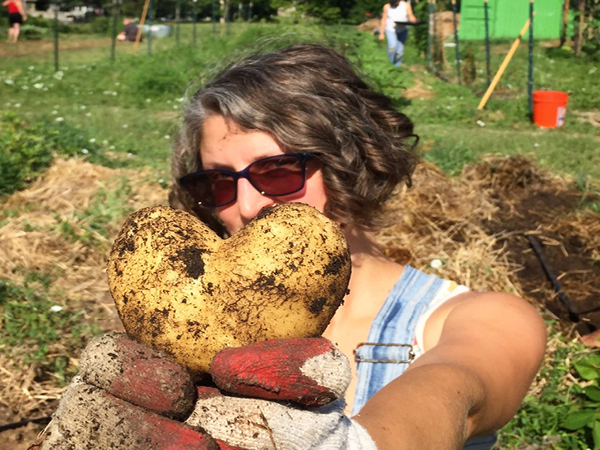 Help us pack seed and plant orders: Weigh potatoes, pack seeds, onions and plants for community partner gardens. Label each flat and bag with the garden’s name. Work in the garage, front office and greenhouse. Build a garden: Help us load the van with lumber, wheelbarrows, shovels, hammers and nails. We’ll drive to the garden site, hammer the lumber together, shovel soil into wheelbarrows and dump into beds. Clean and wrap water boxes: Help us clean out and insulate 4 foot x 4 foot plastic water boxes with black plastic. We use these water boxes to capture rain water from roofs then use the water to irrigate gardens. 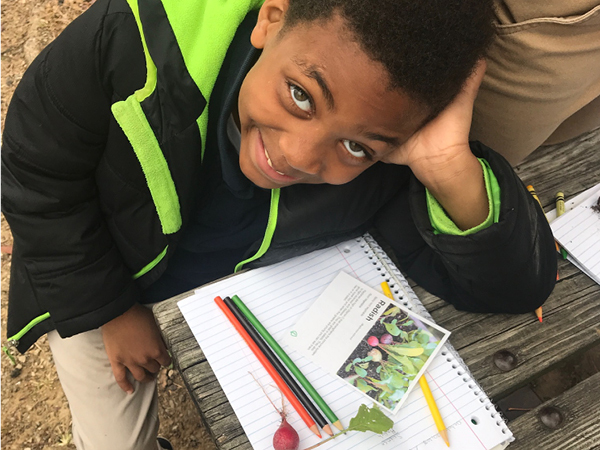 Let us connect you with a local community partner garden: KCCG supports a network of more than 250 community gardens, and additional involvement is always needed. Many of the gardens we work with grow food to donate to food pantries. They would welcome your help. Learn more about Beanstalk Children's Garden. Preparing for spring: The preparation for the upcoming season begins around the first of April as weather permits. Because this garden is intended to be a showcase for the plants, there is always a need for weeding of the beds and sweeping of the bricks. While these may not seem glamorous, they are essential maintenance to keep a pristine appearance. Summer tasks: During the heat of the summer, maintaining the correct moisture level is critical to keep the garden at its best. Watering helps hydrate and is a “cool” way to spend quality time with the plants. Fall Family Festival: Our end of the season Fall Family Festival is always a time for volunteer fun. Typically held the first Saturday after Labor Day, this free event draws visitors that wish to sample a taste of the garden. Volunteers are needed to help with the children’s activities, greeting visitors, serving samples and food, and directing traffic. Late Fall Garden Closure: After the harvest, the garden beds are put to rest by the removal of all debris. KCCG composts the plant refuse and being able to use a wheelbarrow is most helpful as we close the garden for the winter. Learn more about Giving Grove. Each late winter, we purchase many fruit trees for our spring and fall projects. We sort all these trees, pot up about half of our purchase (350 – 450 trees) and package the trees up for delivery to our projects. This is a hands-on process requiring about 10 – 15 volunteers that we typically schedule for the morning or afternoon, for a couple of days. Giving Grove Site Volunteer: Lend a hand to one of our Giving Grove orchard sites throughout the season. Activities can include: pruning, watering, weeding, fruit thinning, and other general maintenance. 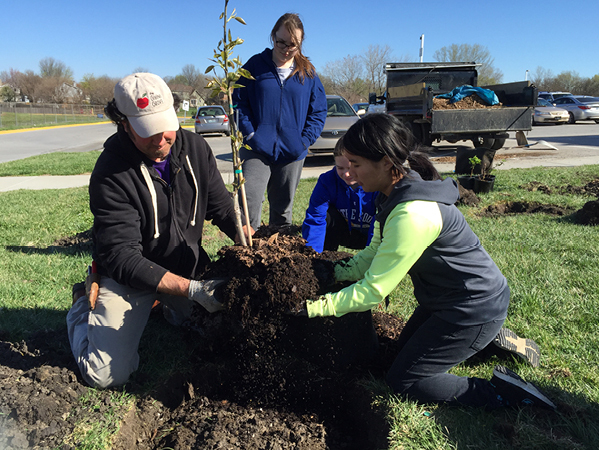 Giving Grove Plantings (April and Oct 15 – Dec 1): Join us for about 3 hours as we partner with neighborhoods, schools, senior living facilities and parks to install new community orchards. Professional Volunteer: We have a number of opportunities that involve research regarding specific aspects of our business, social media, photography and video skills, IT skills, marketing, and most other aspects of the business operations. Set in the wonder-filled Leanna Flandermeyer Beanstalk Children’s Garden, Gardens at Sunset is a unique and beautiful evening celebrating locally-sourced food made by Kansas City chefs, beer from local breweries, and creative and enticing silent auction items. KCCG clients will share how gardening has improved their lives and their community. All proceeds support KCCG's mission to assist low-income households and community groups to grow their own produce. The Fall Family Festival is KCCG's annual fall festival that usually occurs the third Saturday in September. The FFF occurs at KCCG's Headquarters in Swope park (6917 Kensington) and includes garden crafts, games, exhibits, and horse rides! This event is free and open to the public.